Below are some useful information you might want to read over before planning on a conservatory. You are allowed to develop up to 70m3 or 115% of the total volume of the dwelling whichever is greater. However, this is a combination of the total amount of extensions, i.e. is you have had a kitchen extension of 40m3 and require a conservatory of 41m3 this would total 81m3 and planning permission would be required. Should the total be less than 70m3, or 115% of the volume of the dwelling, planning permission may not be required. The same as detached properties, you are allowed to develop up to 70m3. Same as detached and semi-detached, but only 50m3 is allowed to be developed. This type of property has no permitted development rights and in all cases planning permission will apply, there are no exceptions. The above mentioned only applies to extensions after the 1 July 1948. 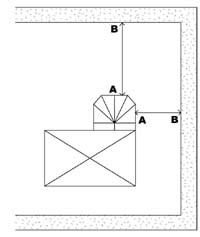 If you build within 2m of the boundary line and the highest point at that junction is 4m or more high. If your planning development rights have been removed. Grade II listed buildings. These may require a hardwood conservatory with a glass roof. 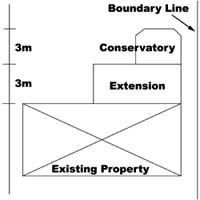 Irrespective of the size of the conservatory, should the distance between points A and B be less than 20m planning permission may be required. Normally the local planning officer will be looking at the projection of the conservatory i.e. how far it will protrude into the garden, normally they are happy at about 3m projection from the original house. However, should the proposed conservatory extend more than 3m he may not look at it so favourably and ask for it to be reduced in size? The reason for this is so your neighbour does not have to look at a large brick wall more than 3m long. Hence the term impact onto the boundary. To overcome this you may wish to include a facet to your conservatory which may help in some situations. (See sketch B) This should be done by your supplier as a matter of course. You can see from this sketch that the total impact onto the boundary is 6m and you could expect the planning office to reject your application. If planning permission is not required a letter of lawful development from the council is always a good item to obtain. So should you wish to sell your property in the future, your have proof that you have complied. However, we strongly recommend, if in doubt always ask your local planning officer. You will find they are always very helpful and they will give you the correct advice so no mistakes are made.